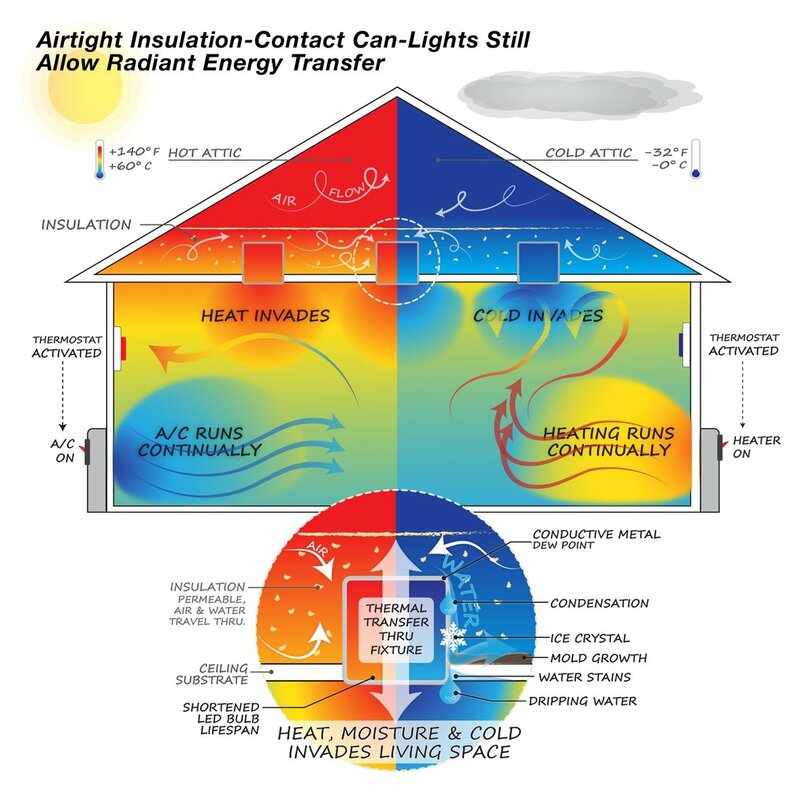 CanCoverIt's Radiant barrier combined with non-conduction mold and fire resistant core stops water, air, sound and energy transfer to optimize overall attic R-Value and U-Value. 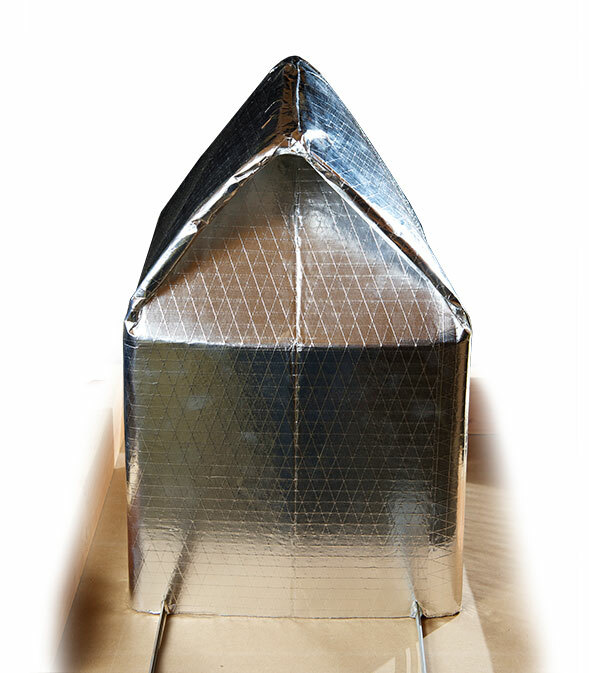 CanCoverIt is not just for energy efficiency, but also health, safety & overall building performance. CanCoverIt™ even improves the performance and lifespan of LED lights! 2845 cfm – Leakage after R38 of cellulose was blown onto the attic deck "
~ 40CFM reduction in leakage per penetration! 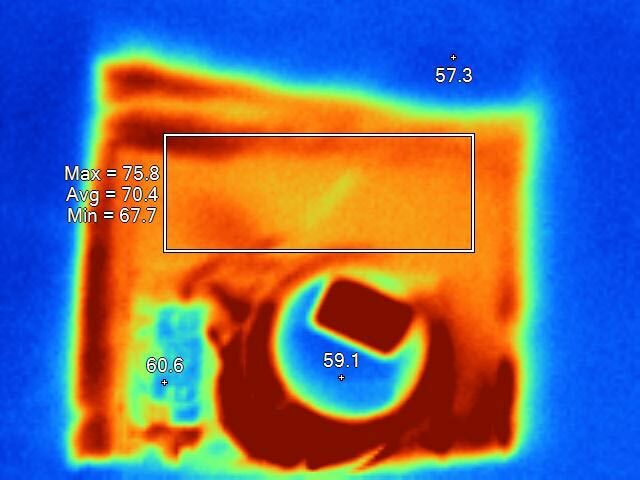 Radiant hot and cold spots in the ceiling resulting in extreme energy loss. 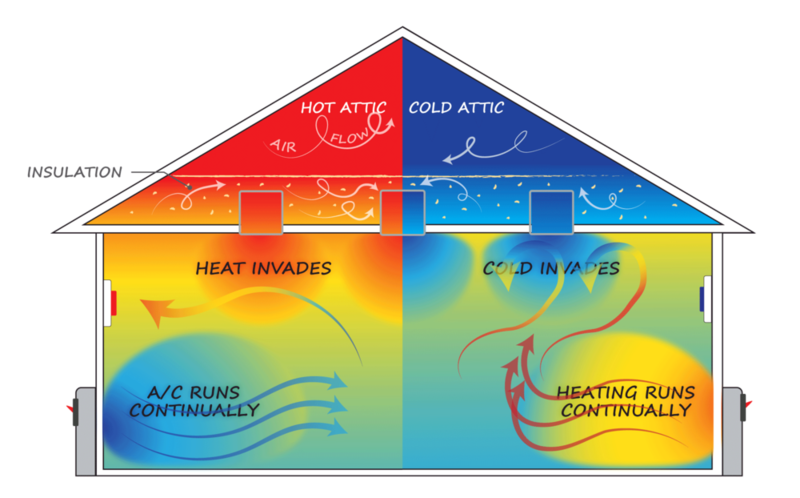 A/C and Heater cycling and air drafts. Moisture and condensation build up leading to mold growth. Water stains, drips and ice crystals on the ceiling around fixture. Light bulbs overheating, flickering and shutting off - premature failure. Left untreated, metal fixtures bleed energy due to extreme conduction and convection energy loss, reducing overall home efficiency. Attempts such as airtight fixtures, insulation contact fixtures, cardboard/drywall boxes all fail to solve the core problem, and in fact create larger unintended problems! To solve the core problem every single fixture must be isolated from the attic environment. Air-tight IC-Rated Can-Lights were once considered a solution but in fact they create new even worse problems. Effectively isolating the fixture requires more than just stopping airflow! Because metal is conductive, attracts condensation and leaks radiant energy. CanCoverIt™ is the ideal fixture companion. 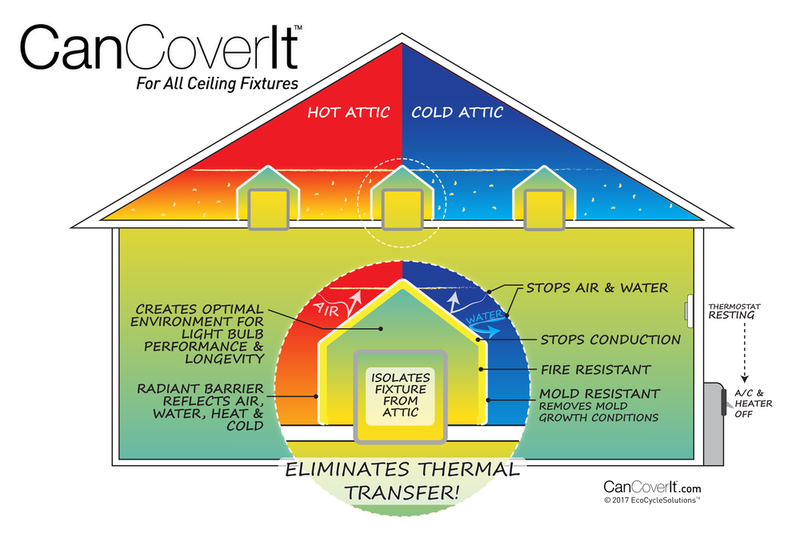 Only CanCoverIt™ has the required geometry, radiant barrier and non-conductive core to effectively isolate the fixture from the attic and bring it safely inside the conditioned interior air. With Vents Removed CanCoverIt Still Protects & Offers Safe Operation for Older Non-IC Fixtures. CanCoverIt Universal Series provides optional safe venting for all fixtures, designed for Non-IC, and creates a dynamic thermal equilibrium chamber to control conduction and convection, greatly enhancing overall home efficiency and comfort. Even with venting CanCoverIt Universal is still mitigating airflow and stopping thermal transfer. CanCoverIt Low Profile Series is for IC-rated fixtures and has no vent yet offers a large air chamber inside to protect from overheating. Ideal for modern fixtures with LED lights. Only CanCoverIt, both series, will provide the correct ambient operating temperature to allow LED bulbs to function best and last longest! Go hands on with professional installers Comfort Advisors and see why CanCoverIt is the best energy upgrade for your home! 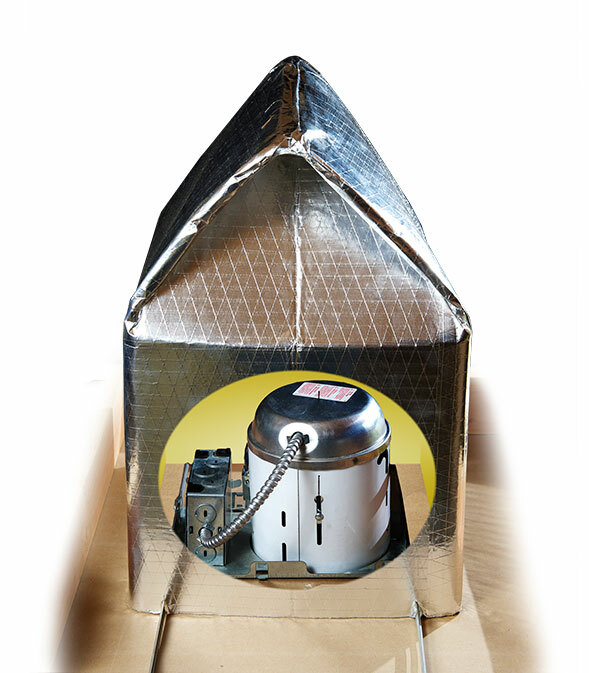 Other solutions have proven ineffectual, only CanCoverIt is designed to work with the real world and solve all issues related to metal attic penetrations. A Seattle Washington mold mitigation company used CanCoverIt successfully for fixing can-light related mold problems. Install CanCoverIt today: save money, increase comfort, and get your home ready for future upgrades! "The covers are easy to work with and we managed to get in and out in a single day with the added blown insulation. A nice safe & snug home and a happy client." "Thank you for producing CanCoverIt, everyone in our organization loves the product. Our sales team loves it because it shows well to homeowners and helps them sell jobs. Our installers love it because it helps them complete their work faster, and I love it because I now have confidence that my team is using the right product to safely cover can lights in the home." "Before I installed the covers I used a laser temp gun to check the temperature of the light 'buckets' with the light off for a significant amount of time and again after the covers were installed. The temperature dropped around 10º F. The hot air draft in the house has now stopped and the house remains cooler during the day." "As I prepared to upgrade the efficiency of my home, I wanted to find solutions that would protect the home and be safe for me and my family. After working with my local electrical and fire code officials to find the best product, they both agreed on CanCoverIt. 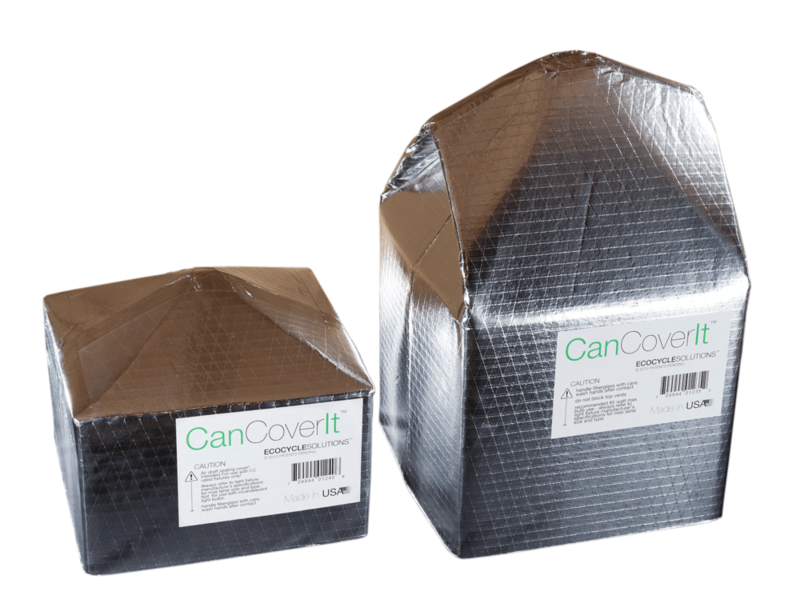 I am happy to have found CanCoverIt, because I sure wasn't looking forward to building boxes out of drywall." 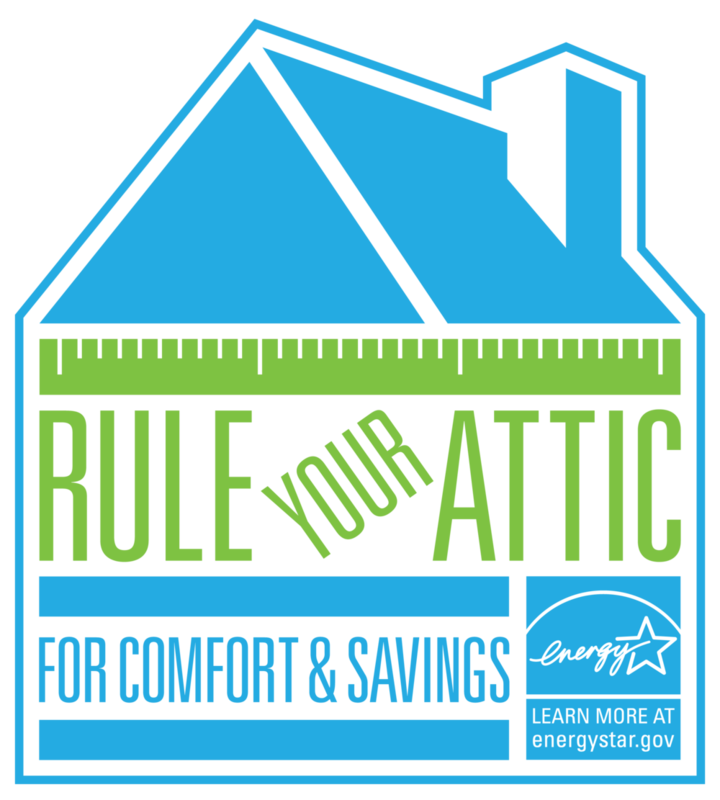 "The [CanCoverIt™ units] have been working as advertised, we noticed a difference as soon as they were put in, but also did a series of other improvements, radiant barrier in the attic reduced overall attic temp about 10 degree's which helped support the can covers. With both changes the house temperature was cooler and stayed cooler throughout the day." CanCoverIt was designed after extensive research around the operations of can light fixtures, the bulbs that go in them, and the installers tasked with sealing them. As a result CanCoverIt is the ultimate solution to one of the home efficiency field's most pressing and difficult problems. CanCoverIt controls fluctuations in temperature and ensures safe heat transfer with no excess waste. CanCoverIt is the first practical, safe, cost effective, efficient solution for insulating non-IC can light fixtures providing complete residential solutions for both contractors and DIYers. CanCoverIt fills an overwhelming need for a safe economically viable and uniform insulating solution. Pop open and go, no assembly required. Safe and durable to install and can be left in the attic for years. An air-tight fit once sealed to the attic floor. Easy to cut and fit around brackets wires, and framing. Our Universal Series features passive venting technology allows all recessed light fixtures to be insulated, even Non-IC rated fixtures. Without CanCoverIt not even air-sealing can help: thermal transfer runs wild! Can't solve the airflow problems of Non-IC, and make the mold and water problems of Air-Tight IC-Rated worse. CanCoverIt provides comfort in all weaher conditions. Save money, increase comfort. Retrofit the Future: The 20 minute crash course in fixtures and the retrofit opportunity.